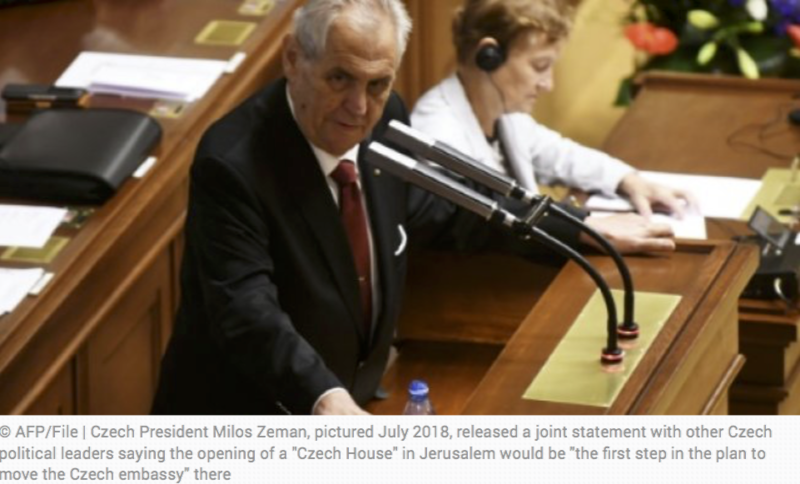 France 24: On Wednesday, Czech President Milos Zeman released a statement regarding the move of their embassy, currently in Tel Aviv, Israel, to Jerusalem. The first step in their plan to move the embassy would begin with the opening of a “Czech House” there in November. Zeman, a 73-year-old veteran leftwinger with anti-Muslim views, promoted the embassy move even before US President Donald Trump moved the US embassy to Jerusalem on May 14. Trump’s move infuriated Palestinians and intensified protests on the Gaza border, with many dozens killed in clashes with Israeli forces that day. Trump’s move also ruptured generations of international consensus that Jerusalem’s status should be settled as part of a two-state peace deal between Israel and the Palestinians. No Comments on "Czech Leaders Endorse Israeli Embassy Move To Jerusalem | France 24"